At long range, small bullet holes are much easier to see in the white than in the black. When you’re practicing at long range on high power targets, one way to enhance your ability to see your bullet holes is to print a “negative” version of the regulation bullseye target. Forum member Watercam uses a Pentax PF-80ED spotting scope. With his 80mm Pentax he can see 6mm bullet holes in the white at 600 yards (in very good conditions), but holes in the black are only visible out to 400 yards or so. Accordingly, Watercam uses a modified “reversed” black-to-white target for 600-yard practice. In the UK, ranges are now using a “reverse-style” target with a mostly white area. Laurie Holland says this allows shooters to see shots much more easily. Laurie reports: “Here’s a photo of the 500/600 yard F-Class match target we use in PSSA comps at Diggle Ranges with club members Chris Hull (L) and Terry Mann (R). We now use this target form at all ranges up to 1K for F-Class, and, yes you can often see your hits at 600 on the target before the markers pull it. Regards from England — Laurie”. If you’re not concerned with official scoring rings, you can use an all-white target with a bright, fluorescent target dot in the middle. A 2″- or 3″-diameter stick-on target dot is highly visible at 600 yards. With a high-quality scope, you can use the small black diamonds in the center for precise aiming. The Birchwood Casey Target Spots® assortment (item #33928-TSA) offers neon orange target dots in 1″, 2″, and 3″ diameters. This “value pack” includes 72-1″, 36-2″, and 24-3″ self-adhesive circles. Share the post "Better Viewing at 600 Yards with ‘Negative’ Targets"
AccurateShooter Forum member Allan, aka “1066”, has improved the performance of his RCBS balance-beam scale with some simple hardware modifications. In addition, Allan has cleverly fitted an inexpensive video camera to one end of his scale. This camera outputs a signal to Allan’s laptop computer, giving Allan a magnified, “big-screen” view of the pointer tip of his scale. That lets Allan observe ultra-small movements of the beam. With the hardware upgrades and video display, Allan has crafted a system with usable sensitivity to a single grain of Varget powder. To upgrade his scale, Allan first fabricated a new U-shaped pan suspension hanger on the end of the scale. This allowed the pan to center more reliably and consistently. Next Allan extended the pointer arm at the opposite end, and attached a very fine graduated vertical scale to provide a more precise visual read-out. This scale has marks corresponding to 0.1 grains (one-tenth of a grain). To improve the function of the beam itself, Allan “cleaned-up” the knife edges on which the beam moves, and Allan also fabricated a simple “approach to weight” fixture (with foam cushion) that gives the beam a smoother transition as it nears max travel. Allan’s real genius was in fitting an inexpensive video camera to display a magnified image of the pointer at the end of the beam. Seeing the “big picture” really helps get the best precision from the scale. Allan acquired a cheap web-cam and attached it via a simple bracket to the RCBS scale. A USB cable delivers the video output to Allan’s laptop. Allan says the web-cam cost less than $20.00 on eBay and required no special software. It was a “plug and go” installation. With the video camera running, the onscreen image is “super-sized” so Allan can track the smallest movements of the pointer tip. You can see how the whole system works in the video below. To dispense powder, Allan uses a slick automated trickler, explained next. The final element in Allan’s high-tech balance beam scale system is a Targetmaster automatic trickler. This unique UK-made trickler is very advanced. It has two components — a dispenser, and a remote sensor that “watches” the movement of the balance beam. Allan pushes a button to start the powder flowing. As the load in the pan approaches the correct weight, an electric eye senses the position of the balance beam. Once the beam “hits the mark” for a correct load, the remote sensor shuts off the trickler. It sounds complicated but it works perfectly. The TargetMaster automated Trickler is a pretty impressive piece of kit that can be adapted to a wide variety of balance beam scales. The components and functions of the TargetMaster automated trickler are shown in the video below, provided by the manufacturer in the UK. 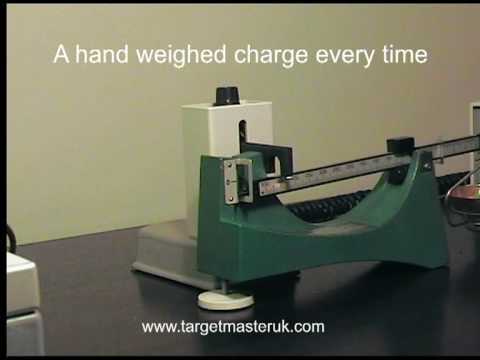 To learn more about this reloading accessory, visit TargetMasterUK.com. 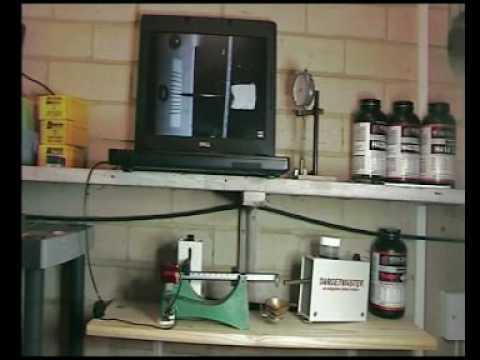 Share the post "Forum Member Rigs Video Display for Balance Beam Scale"